Ever since posting that 5 Minute Reese’s Snack Mix we’ve had a million requests to do more fun snack ideas for the holidays. 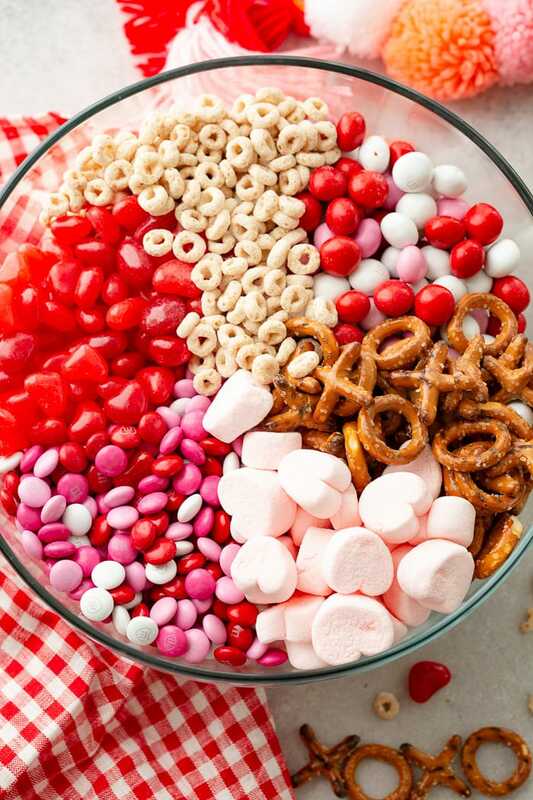 This 5 Minute Valentine’s Snack Mix is a little bit sweet and a little bit salty, but mostly sweet! You can surprise your kids with a little bag in their lunch or take some to your favorite people to let them know of your love! 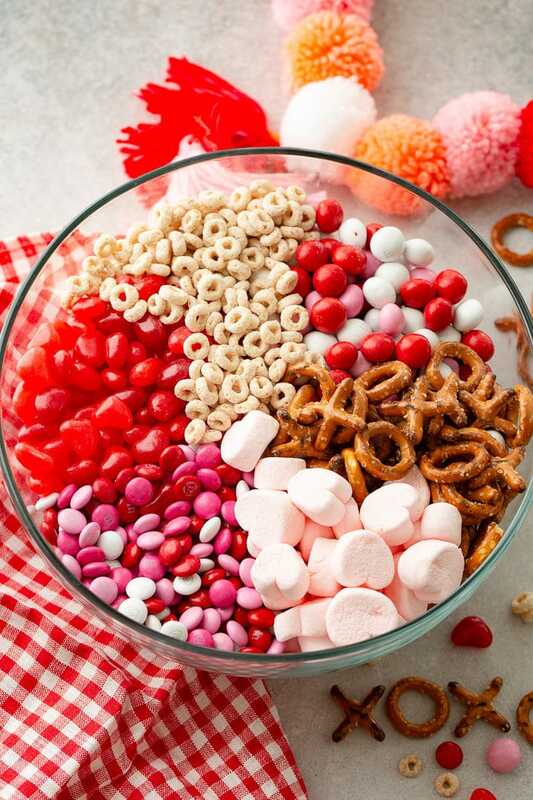 The best snack mixes have something sweet, something salty, something that melts in your mouth, and something crunchy. 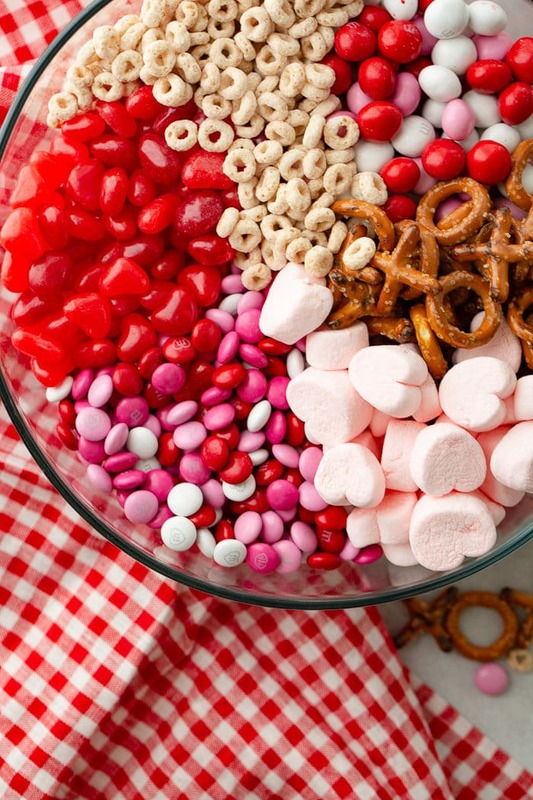 This 5 minute Valentine’s snack mix covers all those bases. I had to run to the grocery store the day after Christmas, and I was floored when I saw the seasonal aisle completely cleaned out of Christmas goodies and covered red, pink, and hearts galore. Holy smokes! I feel like we need to slow down and savor things more before moving onto the next thing, but maybe that’s just me. I have a friend that skips the Christmas cards and sends out Valentine’s Day cards instead. I remember getting her card in the mail in February, and it was so fun! What a genius idea too! One less thing to do around Christmas! I might start doing the same thing with Christmas goodies. 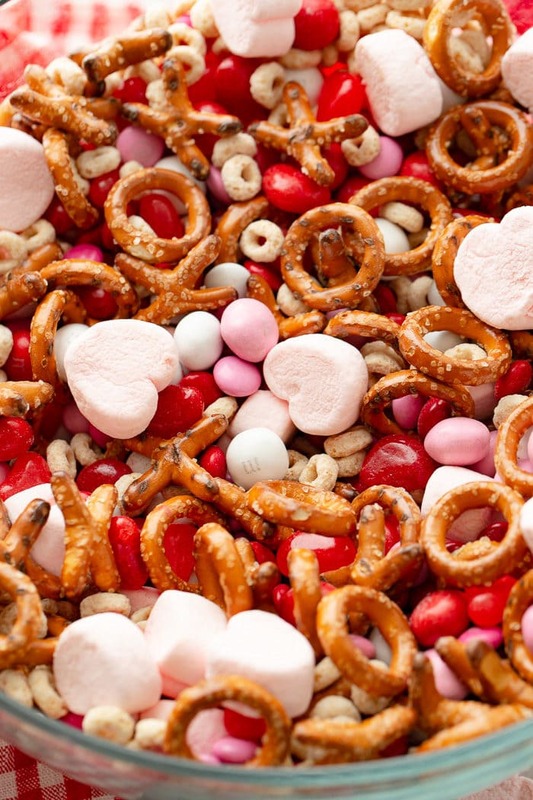 I’ll just postpone them until February and whip up a batch of this snack mix for all my neighbors. It will be so unexpected! This snack mix can be stored for 4-6 weeks if it is kept in an air tight container. The marshmallow will get stale first, so we recommend keeping them separate and adding them right before it is served. This snack mix can also be frozen in an airtight contain for 4-6 months. Let it come to room temperature before eating and serving. It only takes 5 minutes to throw this together, but it can be made ahead of time. If it is stored in an airtight container, it can be made up to a week ahead of time. Again the marshmallows get a little tricky, so leave those out until right before serving. Marshmallows are sugar-based confectionery that is made of sugar, water and gelatin. Those three ingredients are whipped to a squishy consistency and usually molded into small cylindrical pieces and then coated with corn starch to keep them from sticking together. They go back to around 2000 B.C. when the ancient Egyptians would use the sweet sap from the mallow plant to make confections for their gods, nobility, and pharaohs. Marshmallows have to be good if they have stood the test of time for that long!! 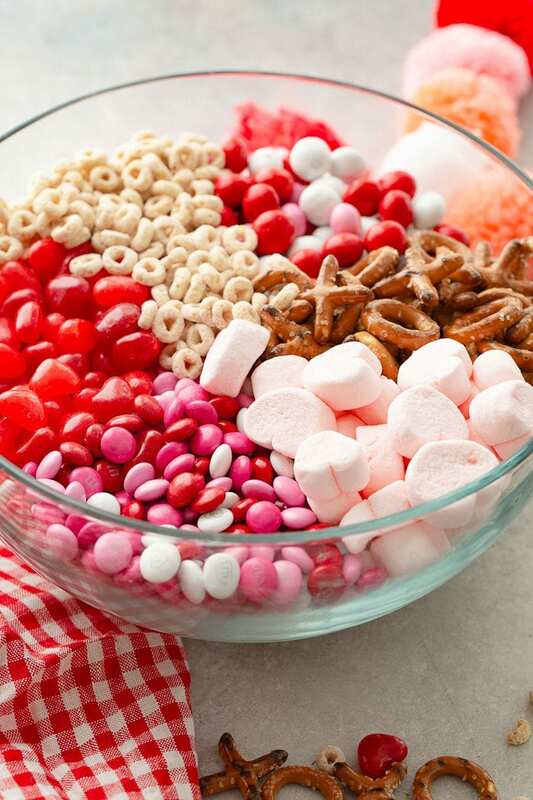 This 5 Minute Valentine’s Snack Mix takes no time at all to throw together, but put it into a cute Valentine’s Day bag and write a nice note, and you’ve got something that will put a smile on anyone’s face! I can’t wait to share the love with all my friends and neighbors! Looking for more dessert recipes to celebrate Valentine’s Day? Try our Strawberry Pink Ombre Cake, No Bake Mini Cheesecakes with Raspberry Sauce, Red Velvet Churros, No Bake Mini Chocolate Cheesecakes, Copycat Lofthouse Sugar Cookies, Reese’s Peanut Butter Marshmallow Cookie Pie, White Chocolate Cheesecake Bars with Raspberry Sauce, or Chocolate Rose Red Velvet Cupcakes! Ever since posting that 5 Minute Reese's Snack Mix we've had a million requests to do more fun snack ideas for the holidays. 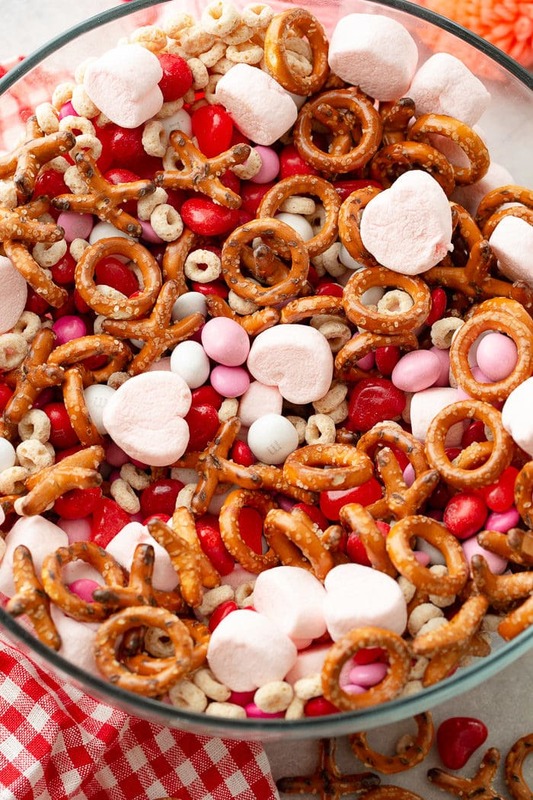 This 5 Minute Valentine's Snack Mix is a little bit sweet and a little bit salty, but mostly sweet! You can surprise your kids with a little bag in their lunch or take some to your favorite people to let them know of your love! Add all ingredients to a bowl and mix thoroughly. Serve immediately. To make ahead: Add all ingredients except the marshmallows, add those when serving.